Martial Arts in Chapel Hill. Community-Minded, Family-Oriented, Behavior Based. Watch a Class / Try a Class? In 1994, Nathan Ligo published his first piece of writing in Black Belt Magazine. Mas Oyama supported the article. If Ligo Dojo were considered the instructional wing of the 501(c)(3) nonprofit, Society for the Betterment of the Human Condition through the Training, Instruction and Propagation of Budo Karate, Ligo Ink would be its publishing wing. Our founder, Sensei Ligo, has been practicing karate for 30 years, but he has also been writing for 20 with an equal fervor. Miyamoto Musashi wrote that “the way of the warrior is the twofold way of pen and sword, and he must have a taste for both ways,” and ever since Sensei Ligo was a child and his first teacher, Master Choi, emphasized the importance of academic success (and made Nathan read Eiji Yoshikawa’s novel Musashi), Sensei Ligo has been driven to pursue both arts. In 1993, with Mas Oyama’s permission, Nathan Ligo, still in college, wrote a magazine article about his teacher that became his first publication. Click here to Read a Black Belt Magazine Article about Mas Oyama by Nathan Ligo. Sensei Ligo would tell you with a smile that while he might have a 5th degree black belt in karate, he only just has something like a 1st degree black belt in writing, yet he is sure that just as he will be practicing karate for the rest of his life, so too will he be writing. Just like karate, if you practice (writing), you will improve. There are more parallels, in fact, between the pursuit of karate and the pursuit of writing than there are differences if for no other reason than the pursuit of mastery is parallel from art to art. In both cases, one has to work tirelessly, exercise discipline, and take chances to propel the process forward. Click here to read a Book Review of Nathan Ligo’s Book, Mightier than the Sword. The review starts on page 9. Sensei Ligo’s most recent writing endeavor is Budo Karate West, a blog that he’s launched to discuss issues concerning Kyokushin-Kan and Ligo Dojo. Having recently completed two new books (which are currently with the editors), Sensei Ligo took advantage of a period of ebbing creative energy and launched this page that all Ligo Dojo students and Kyokushin-Kan members should follow. 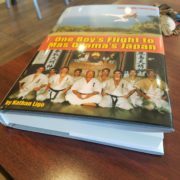 It is earmarked as the Kyokukushin-Kan in the Western Hemisphere Blog. Budo Karate West is an online publication of Ligo Ink. It should therefore be noted that Sensei Ligo pursues the mastery of writing, just as he does mastery of karate, emphasizing of course that it’s the quality of the pursuit that’s important, not the actual attainment of the goal. There isn’t an art, he would tell you, that benefits from being pursued with only a partial effort. Accordingly, Sensei Ligo’s writing is NOT written specifically with success in his karate endeavors, or his nonprofit endeavors, in mind in the short term. An instructional manual would be one thing, but why, if he were merely about promoting his dojo, would Sensei Ligo also be writing poetry? Books in Print by Nathan Ligo. Sensei Ligo’s nonfiction writing is brutally honest. One reviewer noted that Sensei Ligo tells some episodes from his youth in his coming of age memoir that most people wouldn’t want the world to know. Sensei Ligo, however, knows that there is no path to success in writing (i.e. of memoir) without honesty. He is excited, recently, to have a new book coming out, A Kyokushin Beginners Guide : Replicating Mas Oyama’s Budo Karate in the Western Dojo, because this is a book, finally, that he will stock in the dojo, and ask all of his students to purchase and read. The two books currently in print, the memoir Mightier than the Sword, and the novel Hungarian Rhapsody, are not intended for children. The novel, a thriller involving Eastern European karate fighters in an international intrigue, is fairly violent and contains some choice language, and the memoir contains adult themes. Both books DO further an understanding of authentic Budo karate, and authentic Kyokushin. Both expose a Western readership to a reality of karate’s pursuit that is in many cases lost across the cultural (and spacial) divide. Coming Soon by Nathan Ligo. Coming Sometime After That . . . by Nathan Ligo. Click here to Buy Nathan Ligo’s books on Amazon.com. These two books not intended for children. Click here to read a Book Review of Nathan Ligo’s Book, Mightier than the Sword. The review starts on page 9. Welcome to the Ligo Dojo website. My name is Nathan Ligo, director of Ligo Dojo. Please don't hesitate to contact me. All of the dojo's numbers connect directly to my cell phone. Also, be sure to "follow" the Budo Karate West blog, where dojo members get regular updates. I'm so happy you've found us!